A landslide occured immediately in front of Aelfleda Terrace on 27th November 2012, the 150-year-old former jetworkers’ cottages were very quickly demolished afterwards. The heavy rain has provoked a further scare near Fortunes Kippers, here the same area viewed from Google Streetview before the collapse. 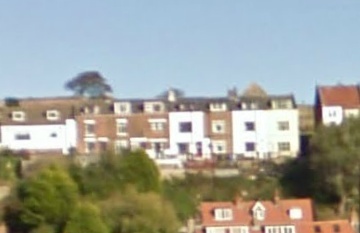 This entry was posted in Too Late, Whitby by chris.twigg. Bookmark the permalink. A very sad sight indeed! Hundreds of years of history gone overnight. So sad for the owners of these lovely cottages. A further worrying development is the saturation of the cliff above Henrietta street and the potential loss of the Kipper shop along with some cottages on this street. Hopefully the council will take measures before any further damage is done.